Japan has a culture of long working hours, but even in this generally tough and stressful working environment some companies stand out because of the complete disregard for their employees’ well-being. They are known as “black companies” and anyone who has ever wanted to experience what working for such organizations is like, without actually getting a job at one, can find out by applying for a special event called “The Black Holiday”. It’s hard to imagine anyone ever wanting to experience what a ‘black company’ is like, but especially so on Friday, November 23, when Japan celebrates Labor Thanksgiving Day. It’s a national holiday and a rare opportunity to enjoy a long weekend free of work-related stress. But that’s exactly why the organizers of The Black Holiday chose this date for their special event. What better way to emphasize just how bad working for a black company can be than having you do it on your day off, right? 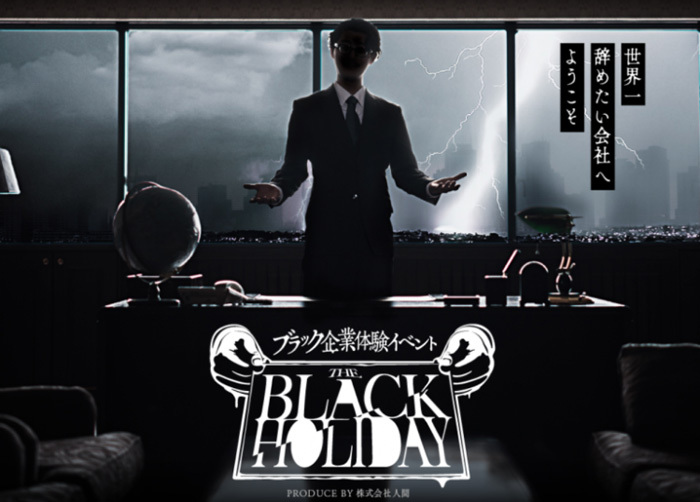 Super Miracle Happy, the fictitious black company that 30 “lucky” applicants will have the chance to work for during The Black Holiday, is actually made up of a group of Japanese actors who will do their best to replicate the working environment of real black companies. It’s unclear what exactly these volunteers will experience during their one-day employment, but we do know that the actors’ performances will be based on true stories from people who have worked in Japanese black companies. "If my boss didn’t like you, he’d make you stand by his desk while he ignored you and fiddled with his PC for four to six hours,” one former black company employee said. "For a required ‘development retreat,’ we were confined in a tiny one-room apartment near our office for several hours,” another person said. According to a promotional job ad, Super Miracle Happy is a company from the medical devices sector looking to higher people who “have stamina, endurance, and never complain”. The poster shows an shadowy and frankly creepy manager welcoming applicants to “the company that people most want to quit from in all the world.” Super Miracle Happy is looking for 30 new employees who will have to work in two 90-minute shifts, one starting 1 pm, and the other at 6 pm, but keep in mind that this is a black company, so expect some mandatory overtime. IT Media reports that selected applicants are likely to see other employees of Super Miracle Happy resting in sleeping bags when they first enter the company’s office, and can expect to be yelled at and scolded for much of their 90-minute shifts. The organizers acknowledge that the stress of working for a Japanese black company, even for one day, could be a bit too much for some people, so they urge selected candidates that their bosses are really just paid actors playing a role. Instead of resorting to any kind of violence, stressed-out employees are invited to offer a letter of resignation if at any point they want to cut their experience short and go home. 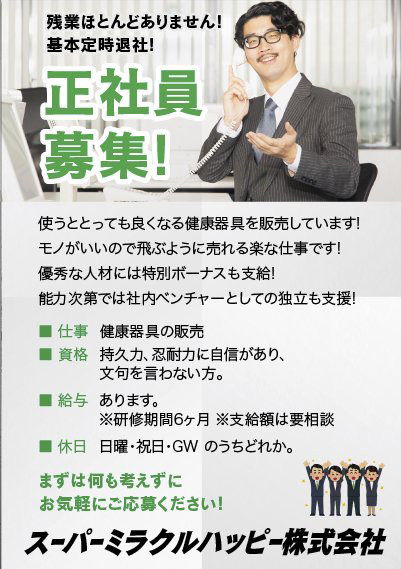 While The Black Holiday sounds like a special event for masochists, SoraNews24 claims that it is actually aimed at two categories of people: employees dissatisfied with their current jobs, but hesitant to look for something better (employees hope that the experience will inspire them to look for better employment opportunities), and managers and executives (organizers hope that they will have greater empathy for their employees after spending a day in their shoes).